The invention featuring high quality and powerful liquid cooling system based on pure materials and simple high tech solutions, which facilitates a very fast distribution of heat for a maximum cooling capacity, designed to suite the satisfactory for all kinds of average PC users, high end users and extreme over-clockers whom would like to bring their servers, workstations, and gaming systems above the velocity limit along with maintaining the temperature below the line of ambient. Who would benefit from the invention? the system is addressed to all kinds of electronic chips, and many fields can take a great advantage of this technology. • Medical fields - Medical electronic equipment - Blood and DNA Analyzers, Magnetic resonance MRI, Computerized Tomography CT Scan, Ultrasound, X-ray. Electro surgery, Brain Surgery, and so on. • Industrial fields - IT servers, D.C.S electronic equipment, Extruder VSD panel, Palletizer VSD panel, Expander VSD panel, and so on. • High end PC users, over-clockers, designers, and gamers. • IT Web servers and workstations. • Individual, small or corporate companies for their servers and workstations. • Basically any device or equipment has an electronic chip needs high demanding cooling system. In the other hand, the components of the system can be upgraded or modified by the manufacturer to suite the category of cooling or even just to increase the outcome potential cooling of the system to any level of performance desired. 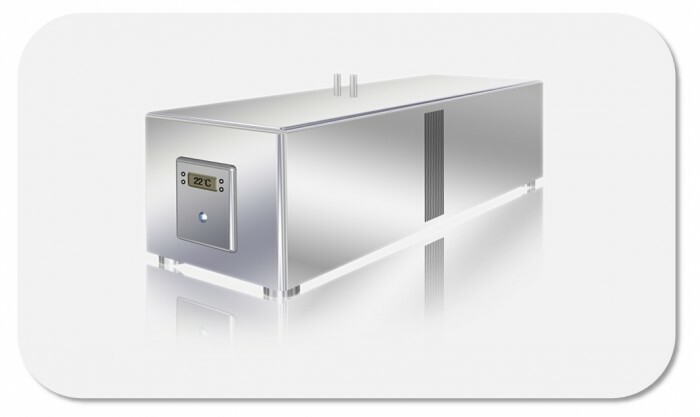 so the system has no efficient competitors, it’s the only cooling system in the world that has the great balance between performance, price and flexibility of manufacturing. Therefore, the quantity of competition is easy market penetration, and the quality of competition is very superior with obvious advantage, and there is no doubt the substantial profit will be very high especially everything is going computerized and electronic. Obviously with the demand from all fields mentioned above, the potential for the invention to expand is numerous products possible to very high, new market level. •	Reduction of CPU core temperatures at max load by 70-80%. •	Significantly improved CPU stability. •	Capable of managing more than one CPU, VGA card or INTEL chipsets. •	Easy and safe to install, operate, store, and maintain. The system has proven its distinguished performance and no systems in the market can be compared to its performance, it’s a fact. 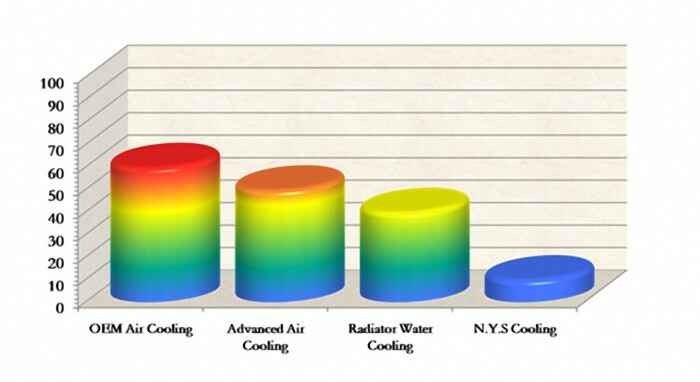 Other systems use a radiator as a major component for cooling (radiators can be affected with the ambient temperature, therefore cooling performance is very limited no matter how big the radiator is) which cannot be any way close to my system performance which has a freezing potential cooling , no radiator involved and in the same time extremely safe. Most of the solutions provided on the market were focused on heat dissipation of the heat sink and radiator designs. Radiator designs were modified to increase the capacity of cooling performance. Unfortunately, the concept of cooling source not yet improved to meet the satisfactory of the CPU in all aspects, because the other end of the cooling system (Radiator) yet… depends on the ambient temperature. in addition these systems cannot be used for many fields or other equipment’s other than computers and cannot be modified to meet the expected performance. It also won the gold medal for the best invention from the Federation of Inventors in Taiwan, as well has been granted the bronze medal in « IENA » exhibition in Germany for best performance. On December 2013 I have been granted “The First Place” among more than 200 best middle east innovations in Ibtikar Exhibition 2013 as I have been honored the golden plaque, excellence certificate, and first place certificate and golden medal. 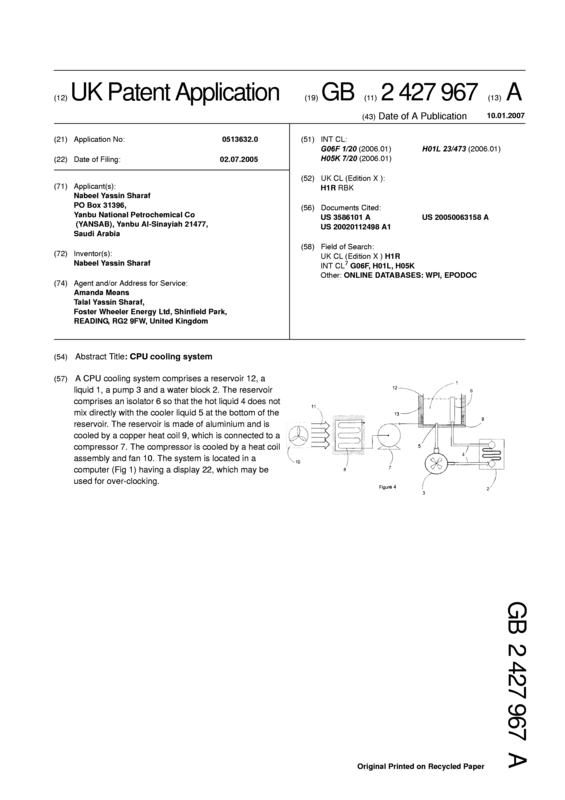 Page created at 2019-04-24 23:59:02, Patent Auction Time.